In the cryptosphere, they say only those who can finally analyze the market or are day traders can make money. But that’s not true!! In the cryptosphere, there are several ways by which you can make profits and earn a handsome amount of money. And the best thing is that you can choose the best way that works for you and can accordingly adjust your reward/risk ratio. One such way of earning in cryptosphere is by running a masternode, but before I tell you how to do that it is imperative that you first understand what a masternode is. Masternode is simply a cryptocurrency full node or computer wallet that keeps the full copy of the blockchain in real-time, just like your have Bitcoin full nodes and is always up & running. But masternodes are considerably different in their functionality than normal nodes. They are different because they perform several other functions apart from just keeping the full blockchain and relaying blocks/transactions as a full node does in Bitcoin/Litcoin. These masternodes are not standalone but they are always communicating with other such nodes to make a decentralized network and are often referred in short form as MN. 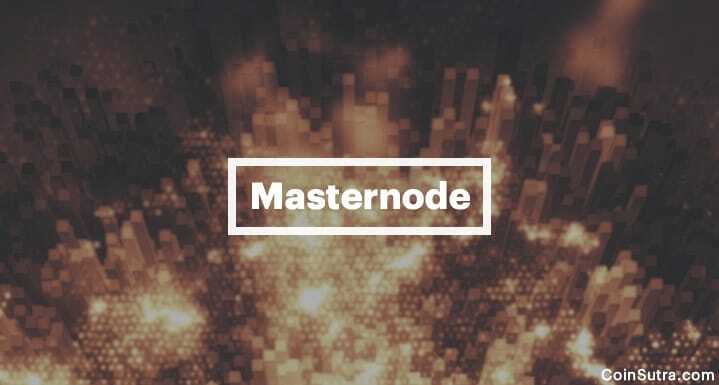 Note: Mostly the masternodes perform the tasks that I have listed above but it can slightly vary from cryptocurrency to cryptocurrency depending upon how masternodes have been implemented. But more or less they perform these functions in a cryptocurrency. What Does It Take To Run A Masternode? Just like full nodes in a cryptocurrency, masternodes can be run by anyone. However, there is an entry barrier in place to ensure that the system doesn’t get malicious. The entry barrier is what one needs to commit or collateralize certain units of that particular cryptocurrency to run a masternode. This is done to ensure that a masternode owner doesn’t cheat or corrupt the system and the best of doing so is by putting this entry barrier where the masternode operator has something at stake in the whole game. So naturally, it becomes very less likely that a masternode operator will cheat because he has a stake in running the whole system and even if he chooses to do so he will be punished in the form of devaluation of their own HODLings. These are the pretty much same requirements for any masternode cryptocurrency. Now I know some you might be thinking that to meet all these above pre-requisites one needs to spend first, so then how will someone earn? Absolutely correct! And this takes me to my next section of this write-up which gives further clarity on the topic. How Are Masternodes Useful For Cryptocoin Investors? Masternodes are very useful for crypto investors because of running a masternode you are incentivized. Consider it just like earning a monthly or weekly interest on your crypto holdings. Different cryptocurrencies have different incentive models through which an MN operator can earn a decently monthly or weekly income. I call it smart passive income. Another thing to understand here is that you should choose the right currency for investment if you are solely investing in running a masternode. You should compare the percentage yield against the investment. In short, you should smartly calculate your ROI. As of now, there are numerous cryptos out there in the market that allow you to run a masternode but not all of them are worth running because of meager incentives they provide. I know the next thing that you would like me to talk about would be which cryptos to choose for running a masternode or some of you would also like to know how to identify if the crypto in which one has already invested allows running a masternode. For people with such queries, there are few links where you can check if your crypto allows you to host an MN or not. And for the other, I would ask them to stay tuned to CoinSutra because I am preparing a list of profitable masternode coins which I will be sharing soon. Now it is time to hear from you: Which cryptos are you invested in? Are you running a masternode already? Do let us know your comments & experience of running an MN if you are already doing so. If you found this post informative, please share it with your network! 1 What Is A Masternode? 1.0.1 How Are Masternodes Useful For Cryptocoin Investors? any update on new masternode coins? masternodes are very interesting , and a really good passive income . if you can’t gather the coins needed a shared masternode is the way to go. I have 5 right now and i will invest in at least 5 more this year. lookup shared masternodes or masternode pools . Are you having your own MN Server or invest in MN Pool? i want to start a masternode. but i dont have a knowledge about it. can you please advise me about how to set up masternode? I was not knowing this, thank you so much! so basically, i’ll need a dedicated ip, for which i need to shell out some extra bit, other than this i dont see any additional expenses, are there ? also, do you think, the pc where m mining or running Mn should have a good antivirus installed or its ok even if a dont have anything except the windows firewall ? I have old Pcs lying, would you recommend mining with em with 2gb ram and 1.8 ghz core 2 for some altcoins as i know mining in topcoins is v difficult. Great introduction to masternode, thank you. What about the hardware required to run a masternode? What is needed? All you need is a VPS which is running 24/7 and you can deploy your masternode there. Other solution is to join masternode pool, for example Nodexo. They are launching their platform and will ensure trust and transparency among masternode investors. it was pretty easy for sparks. server on vultr. follow their guide in the git hub. get help in the discord channel . How are you doing with it? I would love going masternode route. Set it and forget. But has to be a coin that will be around…..
Hey DudhirI love your research on MN, it is brilliant, you are a genious. Can you please help me to choose the best Masternode. So my target is to get start a master node that would give me a continuous coinage distribution (income) of US$10,000 per month. I want to get the best ROI, but I see a lot of scammers offering insane ROI over 1000% even upto 18,197% (NihiloCoin).. – I wouldn’t run the masternode locally but rather from a VPS in the cloud for $10 to $20/month. And I could run multiple masternodes from the same VPS. Will I need to have multiple IP addresses if I run MN for different coins? Great article. I now need to find out what coin is the lowest start up investment and a balanced return on investment after bills. Great introduction to understanding masternode SUDHIR KHATWANI, this article answered all my questions about masternode. MasterNodes are the future financial infrastructure.Great field for investing IMO.It does require to risk some significant funds but the returns will be solid if the cryptosphere expands as expected. I enjoyed your write up which is concise and straight to point. Though i am new in crypto trading but your idea has opened my eyes. Weldone! I would like to join your newsletter on future masternodes.